One fundamental attitude shared by Buddhism and science is the commitment to keep searching for reality by empirical means and to be willing to disregard accepted or long-held positions if our search finds the truth is different. Buddhism, or Buddhadharma, signifies the teachings of Buddha Shakyamuni and personal experiences or realizations of these teachings. Buddha gave eighty-four thousand teachings and methods for self-liberation. All these teachings and realizations of them constitute Buddhadharma. In general, ‘Buddha’ means ‘Awakened One’, someone who has awakened from the sleep of ignorance and sees things as they really are. 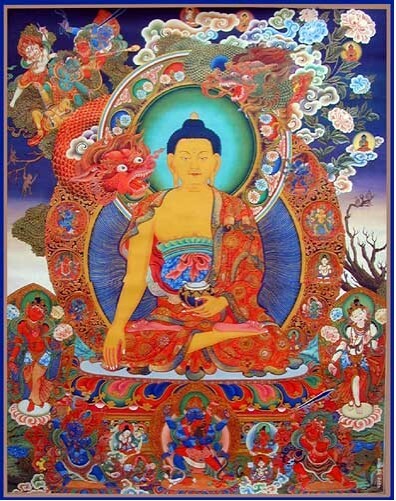 Thus, his or her compassionate wisdom is impartial, embracing all living beings without exception. It is beyond the scope of this page to survey the numerous schools and traditions of Buddhism that have evolved in different cultures. Buddhadharma is a vast and profound 2,500-year-old tradition that can fully occupy more than one lifetime of study and practice in just one school. In the context of this website I can offer only a simple introduction to the Buddhadharma, its relevance to the rest of this site, and a taste of the resources that have benefited and delighted me, for those who are interested. The emphasis is on Tibetan Buddhist views and resources since that is the tradition I was trained in. A superficial reading of Buddhism has led some people to reject it as too ‘grim’ because of the assumed emphasis on suffering. However, that misses the point, which is that humans have the capacity to free ourselves from the mental entanglements by which we torment ourselves about the realities of life on this planet. The basic realities are birth, sickness, old age, and death—and the impermanence of all experience. Impermanence and physical and mental pain are inevitable in human existence, but the struggle to avoid those experiences is not inevitable. In fact, attempts to avoid pain and impermanence are what cause the ceaseless dissatisfaction and suffering of monkey mind. In the West, we understand that in order to solve a problem, we must accurately identify the problem and find the root of it. Likewise, in Buddhadharma we seek the root of the problem of suffering. The Second Noble Truth is the origin of suffering, samudaya. This is commonly understood to be attachment to transient things, and ignorance thereof. Transient or impermanent things include physical objects, circumstances, ideas, and all objects of perception, including the perception of a continuous, abiding, separate self. The struggle to maintain, secure, and enhance a self that is transient—in fact, illusory—is the root of suffering, as is our ignorance of what we are doing and the futility of it. The fixation on an illusory self, known as ego, creates all our cravings and aversions. We fixate both on what we identify as “me” and what we perceive as “not me” in an attempt to solidify an ever-changing self. Fixated mind keeps us engaged in struggle while ignoring the space of awareness beyond ego. We need only drop the effort to secure and solidify ourselves and the awakened state is present. But we soon realize that just ‘letting go’ is only possible for short periods. We need some discipline to bring us to ‘letting be.’ We must walk the spiritual path. Ego must wear itself out like an old shoe, journeying from suffering to liberation. This brings us to the Fourth Noble Truth: the truth of the path of meditation. In the Buddhadharma, meditation is the practice of being present to one’s own state of mind in the here and now, and relaxing into “nowness” through the medium of the breath. By relaxing into the present moment, we allow space into our minds, which reveals the sane wakefulness that resides beyond monkey mind. But the path the Buddha prescribed goes further than meditation instruction alone. The path is eight-fold: the Noble Eightfold Path of right view, right intention, right speech, right morality or discipline, right livelihood, right effort, right mindfulness, and right samadhi or absorption—a non-dualistic state of complete, one-pointed, undistracted presence. The Noble Eightfold Path describes the way humans can awaken and conduct ourselves in accordance with the dharma, the reality of the world, things as they really are, and thus cease suffering and achieve peace and happiness. This is the famous “middle way” of Buddhism between the extremes of eternalism and nihilism, self-indulgence and self-denial, delusion and despair. The nondualistic middle way is to see the wholeness-holiness-sacredness of the world and conduct our lives according to that view. Achieving a nondualistic view is quite challenging in the Western world where Cartesian dualism still reigns. We are so accustomed to seeing everything in terms of polarities, or mutually exclusive opposites – such as self and other, humans and animals, culture and nature, spirit and matter – that seeing the inseparability of these supposed opposites requires conscious contemplation. The “good news” of the Buddhadharma is that we can liberate ourselves from dualistic delusion and confusion, and thus from suffering, through meditative discipline. We walk the dharmic path by paying attention to both our own state of mind and the situations we are in. Altogether, the eightfold path is a process of simplifying, opening, and bringing more and more space into our minds and lives, which enables us to see beyond the demands of ego and align ourselves with interdependent reality. Thus our conduct becomes appropriate, and eventually impeccable. Dharmacakra on Jokhang Temple, Lhasa, Tibet. These are the basic teachings of the Buddha, upon which all the other teachings are based: every human being is endowed with fundamental sanity and inherent goodness, and we are all capable of liberating ourselves from neurotic patterns that keep us enmeshed in painful situations. The great gift of Buddhadharma is the path to freedom that it offers, with time-tested methods of working compassionately with our own minds and with others. However, as unique and potent and true as the divine, holy Buddhadharma is, and as effective as it is for achieving peace and clarity as individuals and communities, it does not offer clear directions for dealing with the unprecedented global crises that our species now faces. The state of the world demands change in the way humans live with each other and within the larger living system that is the Earth. If all humans were dharmic, the world would not be in the crisis it is in. But dharmic people are in the minority, and a tide of insanity and destruction now threatens civilization and thousands of species, including our own. Buddhadharma offers the Big Picture of how all sentient beings are interdependent and how the state of our minds affects and is reflected by our world. 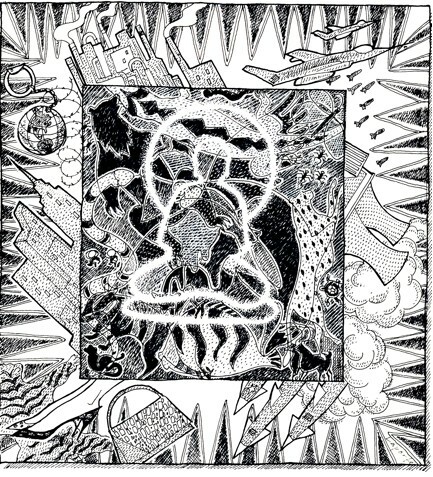 Dharmagaians extend that holistic perception to the interdependence of the “world problematique.” As Buddhadharma seeks the root of suffering within the minds of individuals, Dharmagaians seek the root of our planetary crises in the worldview—the collective mindset—of the dominant culture that is shredding the web of life. Dharmagaians seek to contribute to the Great Turning from the industrial growth society to a life-affirming, ecologically sustainable human presence on Earth, this precious, miraculous planet, with its delicate, fragile biosphere. 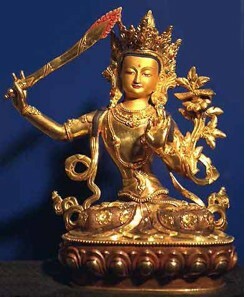 From a Dharmagaian perspective, the Buddhadharma’s contribution to the Great Turning can be profound; for Buddhadharma provides the skillful means and wisdom for the psycho-spiritual transformation that must take place within ourselves if humans are to liberate ourselves from our materialistic cultural conditioning, habitual patterns, and instinctual impulses, and adapt to the realities of Earth and the order of the universe, the Dharma. The Great Turning, like the path of Buddhadharma, depends upon liberating ourselves from the seductions of the dominant culture that appeal to monkey mind, play upon our dissatisfactions, and entangle us in dukha. There is no liberation without an internal confrontation with the dominant consumer culture that exploits the human ego by manipulating our cravings and attachments to transient things, constantly recreating the origin of suffering. In order to give our compassion an effective—or, we might say, strategic—form, the Dharmagaian vision of the Great Turning draws on the worldly dharmas of many fields, and especially science, for an understanding of our dilemma and a way forward. In this Big Picture, the planet is in a state of emergency that is unprecedented within the history of the human species. Our ailing planet requires collective change on the part of our species, a global mind change, a Great Turning towards a holistic, life-affirming, ecological worldview and culture based on a new cosmic story. Cosmologist Brian Swimme is my primary teacher of the New Cosmology, which is an important aspect of the Great Turning. The new cosmic story is based on the evolutionary history of the universe and the Earth, and it places our species within the perspective of deep time, encompassing the evolutionary past and future. In The Current Moment Swimme notes that the fundamental significance of our time is that humans are bringing an end to an entire geological era, the Cenozoic Era. 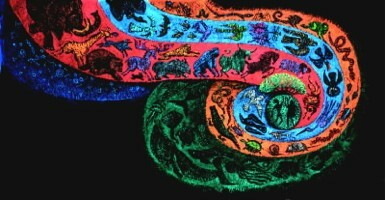 The Cenozoic Era is the 65-million-year-long age of mammals, which gave birth to the human species. The Cenozoic is coming to a close because humans are eliminating the species of our time at an estimated rate of 20,000 a year. Without humans, the normal rate of extinction would be around one per year. Humans have accelerated the rate of extinction thousands of times. This means that our impact is changing the functioning of the planet. Swimme suggests that the extinction of planetary life was not something that Plato or Lao Tzu, Buddha or Christ could even imagine. In ancient times, nobody had ever heard of species becoming extinct, so they did not address the planetary state of emergency that is now unfolding. 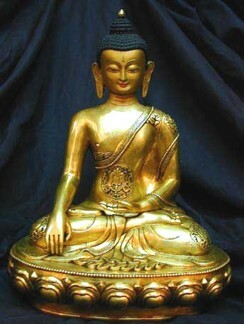 As far as I know, the Buddha did not teach what to do when the Lords of Materialism have brought about the most destructive moment in 65 million years, nor did he teach how to turn the entire human species away from a destructive path based on false beliefs, to a way of life that harmonizes with and enhances the larger living systems we are part of. being a human, and a new planet. That’s the challenge - to think at the level of creativity that's required by this moment. It's not just a new civilization that we need to give birth to; we're actually giving birth to a new geological era. And it's never been done in human history. It's a level of creativity that the Earth has manifested before - but humans have never been called upon to produce ideas at the level of planetary creativity. That's our moment. The Great Turning is a work in progress that Dharmagaians are actively engaged in. There is no new worldview and no new human society that we can subscribe to or buy off the shelf. We must actively participate in creating the new worldview and society if we wish for the Great Turning and our species to succeed. It is something we do for the sake of our own sanity and integrity, as well as for the sake of all sentient beings living now and yet to be born. I’ll be the first to admit that it isn’t easy to digest the magnitude of our moment in history, or to absorb the idea that we live in an “end time.” This truth of our time is painful and frightening, but it’s one of those truths that we ignore at our peril. The question for ecocentric Buddhists like myself is, why aren’t more Buddhists ecologically engaged? Why are there not more Buddhist Dharmagaians? It isn’t that Buddhists don’t have the tools to take in the truth of our time. Foreseeing unpleasantness and preparing for it is an aspect of Buddhadharma practice that has probably contributed to its survival for 2,500 years. In anticipation of the destructive Chinese occupation of Tibet, foresight brought Buddhadharma out of Tibet and to the West. 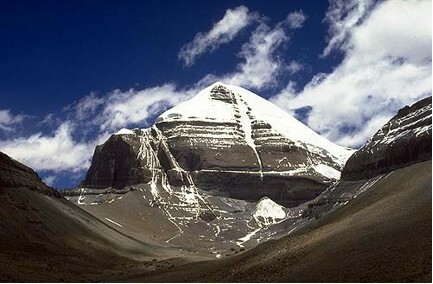 In Tibetan Buddhism one of the intermediate practices is to contemplate one’s own death: “Death comes without warning, this body will be a corpse.” Contemplating the reality and inevitability of death is one of many practices for letting go of delusion and opening to the impermanence of things as they are on this Earth. If hanging onto things that are impermanent causes needless suffering, acceptance of the reality of impermanence becomes a basis for sanity. Perhaps the answer to my question, ‘Why are there not more Buddhist Dharmagaians?’ is that to become a Dharmagaian, we have to break cultural taboos. We have to have the courage to turn around and question our anthropocentric social conditioning and its effects on the whole of life as well as on ourselves. We have to turn around and say, “Enough!” to the dominant culture’s ecologically and socially destructive practices. We have to think big, like the planet. To break taboos and challenge the culture takes us out of our comfort zones and exposes us to risks that simply doing our Buddhist practices and working for our own enlightenment – or teaching Buddhadharma – doesn’t. It is not in the tradition of Buddhism to challenge the culture it is in the process of penetrating, although the Buddha himself questioned and challenged his own culture. But Buddhism might not have been able to take root in as many different cultures as it did if it had shown itself to be as subversive as it is, and had openly challenged the cultures it was trying to take root in. In a culture as materialistic as the West, Buddhadharma is quite subversive, but it generally keeps a low profile. The idea is for practitioners to change themselves from the inside out, and thus to create social change from the inside out. This actually worked in many countries until the modern era. It took centuries, but it worked. 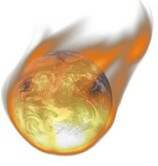 However, now we’re in the era of planetary emergency and we don’t have centuries to effect social change in the West. Buddhism began to take root in the United States only a few decades ago. Now, within the first decades of the 21st century, global crises are converging with increasing speed. Risks to the biosphere, civilization, and the survival of the human species – and therefore to the survival of the Buddhadharma – are far higher than they have ever been before. So there is no avoiding risk, whether we are paying attention or not. As far as we know, those alive now may be the first humans to foresee the decline of our civilization and have the opportunity to prepare for it. Whether records of conversations that are proliferating at this time – see Positive Disintegration, Peak Oil, and Cassandra Club – will survive the decline, we do not know. Some people are concerned about preserving things of practical value for the survival of humanity in the 21st century and beyond: such as knowledge, skills, hand tools, and co-creative culture. These are no doubt important. However, in the interests of promoting sanity among human descendants, I believe that it is equally important to pass on an understanding of how and why this disintegration occurred, and proven techniques for keeping our sanity in the midst of chaos, shock, and trauma. This means preserving eco-psycho-spiritual wisdom – including, especially, the Buddhadharma – and promoting it among future generations by any means possible. For this task, Dharmagaians may have a special responsibility, and it is to this task that this website is dedicated. But it would be helpful if more Buddhists joined the ranks of Dharmagaians and spoke out about the larger issues facing the human collective, and the relevance of the Buddhadharma for coping with our planetary emergencies. Some of the most creative and influential Dharmagaians have been Buddhists, such as Gary Snyder, Robert Thurman, Joanna Macy, John Seed, Thich Nhat Hanh, and Joan Halifax Roshi. We could use more like these. The young 17th Gyalwang Karmapa is showing promise of being a Dharmagaian leader, at least for Tibetan Buddhists, and perhaps for a much wider public if he succeeds the Dalai Lama. Let us hope so. • The path of the Great Turning is a path of collective evolution that offers the opportunity to bring our species into alignment with the dharma of the Earth. No humans are exempt from this path if we wish for our species—and the dharma—to survive. The Noble Eightfold Path is an excellent model for communities to use as they work toward sustainability. That is the view of this Dharmagaian. The rest of this website provides much more detail on the views, practices, and actions that other Dharmagaians suggest and exemplify. The quotes on this page are offered to provide inspiration and support for integrating the Dharmic journey with the Gaian journey. For articles, links, web videos and audios, movies, and books on Buddhadharma, click here. For Chögyam Trungpa, click here. See the Gaia and Great Turning sections for more on Dharmagaian responses to the challenges of our time. Remember that Dharma is Nature and Nature is Everything. The 16th Gyalwa Karmapa, well known for his visions and prophesies, designed this flag from a vision that came to him in a dream. 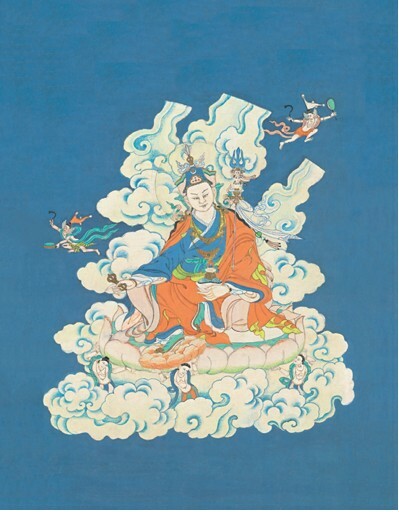 He called it “Namkhyen Gyaldar (Victorious Flag of Buddha’s Wisdom).” He proclaimed, “Wherever this banner is flown the Dharma will flourish.” According to the outer meaning the blue represents the sky or heaven. The yellow symbolizes the earth. 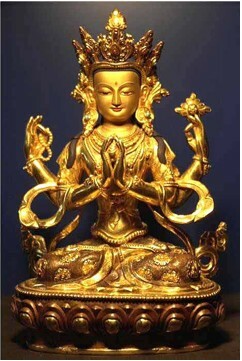 The wave symbolizes the Buddhadharma penetrating heaven and earth. According to the inner meaning the blue represents vision and spiritual insight and the yellow symbolizes our experience of the everyday world. The symmetry of the wave pattern shows the interdependence of the absolute and relative levels of reality. 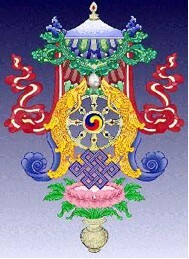 According to the secret meaning, the blue symbolizes emptiness-wisdom and the yellow represents compassionate action. The wave is Mahamudra: the union of wisdom and compassion—the ultimate realization of one’s true nature. The world we live in is getting smaller and people's actions have tremendous impact. In the era in which we live people cannot get away with clinging to their beliefs. I don't have any personal attachment or clinging to being a Buddhist. We need to step outside the boundaries of Buddhism and really go out and share the benefits of our Buddhist practice with the rest of the world.